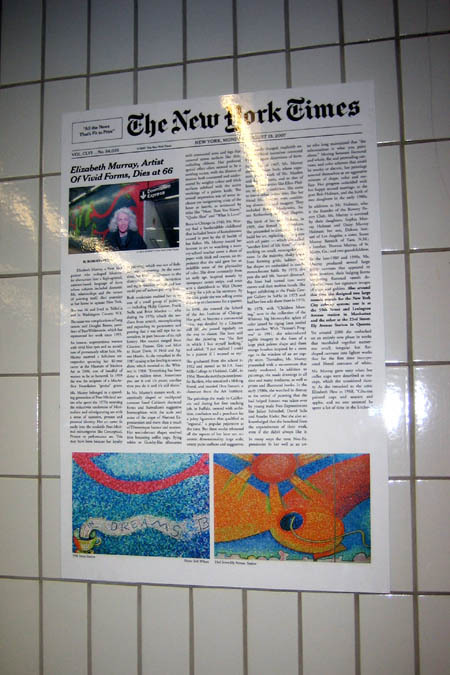 Yesterday I discovered a disheartening piece of news as I slogged through the 23rd Street – Ely Avenue hub of the subway. 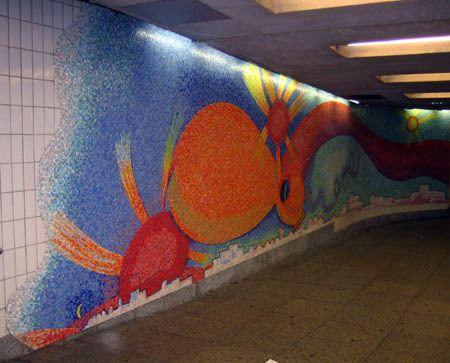 I was never a big fan of her work as an angry feminist art student, but her subway murals (which can be seen at 23rd – Ely Avenue in Queens and 59th Street and Lexington in Manhattan) forced me to make a reassessment. If a work of art can make places I find otherwise repulsive less of a chore (and trust me, I avoid 59th Street and Lex like the plague) it is worthwhile in my book. Thank you for making my numerous schleps through both of these subway hubs a little brighter, Elizabeth. You will be missed.